Tonight we are camped for one night at Painted Rock Petroglyph Site, which is a BLM campground near Gila Bend, AZ. This is, as they say, not the middle of nowhere but you can see it from here. It’s a gravelly spot about 11 miles north of I-8, where a large mound is covered with incredible ancient petroglyphs. I talked about this site in another blog from about two years ago, the last time we were here. We are here simply as a stopover on our way home. Our trip to Anza-Borrego is at an end, and it’s time to head back to various obligations. We seriously considered extending our visit, as was the norm when we were traveling full-time, but this time it seemed to make more sense to get back to the appointments and commitments we’ve made in Tucson. Brett commented today that we were getting the stereotypical experience of “normal” weekend campers: you plan for a trip and the weather is, shall we say, “sub-optimal.” But the moment you leave the campground and get back to work, the weather turns gorgeous. We were certainly not suffering in Anza-Borrego but I would have appreciated a bit more heat at times. Still, a sub-optimal trip in Anza-Borrego is still better than most days at work. Our last day was actually quite nice. We drove 50 miles to the extreme southern end of the park to visit friends who were camped at Agua Caliente County Park. The weather remained a bit cool but perfectly sunny and calm — excellent hiking weather. Eleanor stayed at their campsite to gab with Larry, while Emma, Bill, and I tried a new hike that began at the nearby Mountain Palm Springs primitive camping area. This hike, a mere 2 mile roundtrip, brought us up a wide arroyo that led to a “palm bowl” of perhaps a few dozen palm trees. 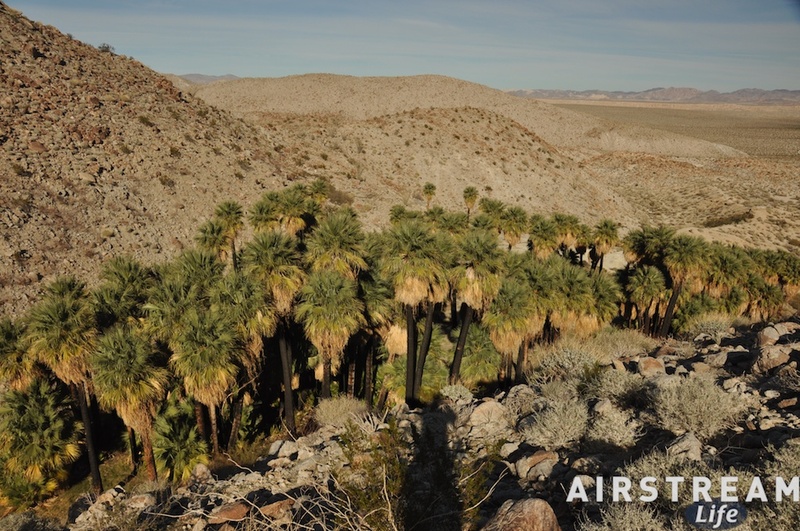 It is called “100 palms” but since fires and floods periodically modify the oasis, it’s no surprise that at present the number of palm trees is a bit fewer. 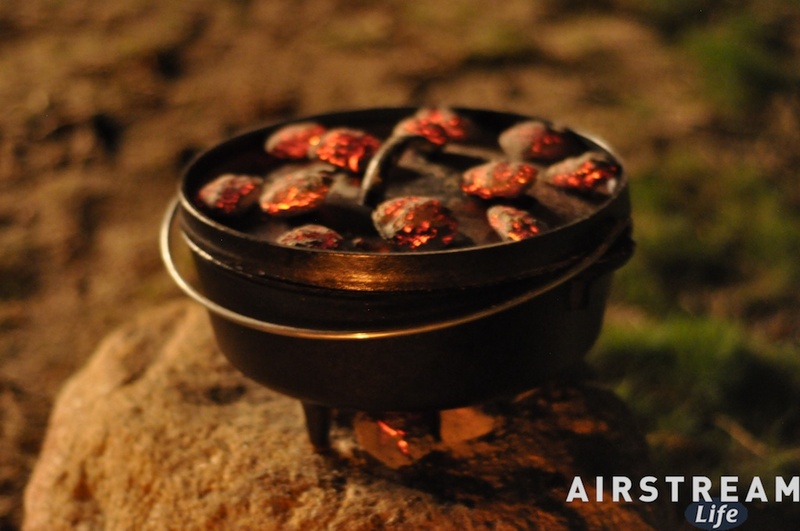 The night before, Alex broke out his cast iron gear and cooked a huge roast for everyone over the campfire. He also demonstrated dutch oven cooking to me, with a new Lodge cast iron oven that he picked up at the factory a couple of weeks ago. He made a fantastic “dump cake” of canned cherry pie filling and chocolate cake mix. Simple, and delicious. The sun rose full again this morning and it was with some regret that we slowly packed up to go. Charon and Alex will be staying while longer and then traveling to the Los Angeles area, Quartzsite and perhaps other stops. We’ll see them again in Tucson in a few weeks. Laura will be flying back east tomorrow, and we hope to see her again someday too. Of course today the weather was absolutely perfect in every respect. I don’t mind — it’s nicer towing in perfect weather. 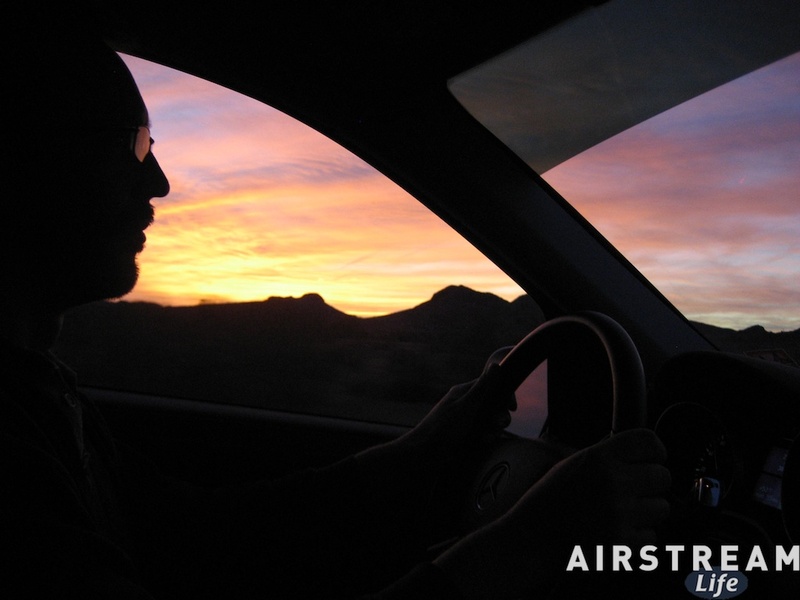 We can have the windows open for some of the drive, and the rest stops are always more pleasant. The scenery was spectacular, with the bluest possible blues in the skies and canals, deep greens (thanks to the recent rains) in the Imperial Valley, and reddish-purple mountains encircling the desert hues in every direction. We arrived here at Painted Rock Petroglyph Site around sunset, which was ideal from my perspective. There was just enough time to pick out a campsite before the sky light faded. I pulled out the Weber grill to cook some sausages for dinner and watched the stars slowly appear, while Eleanor whipped up some vegetables and pasta. This is a good way to conclude our trip, camped in a very quiet spot beneath a clear western sky. 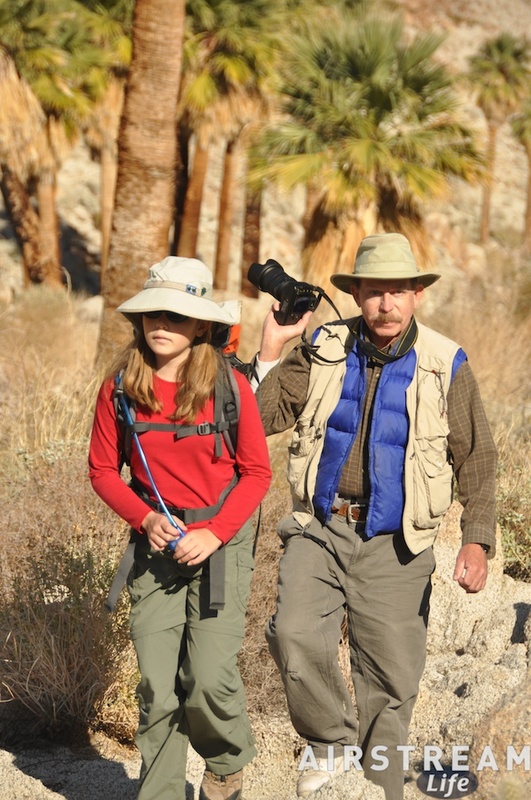 Thanks for the images and memories of our hike to 100 Palms. More images and information about this hike are found on my posting, “Basking in the desert sun”.